ON OCT. 27, 2017, Robert Shibley, dean of the School of Architecture and Planning, along with faculty members Omar Khan, Korydon Smith and Gregory Delaney, sat in a conference room waiting for a phone call. In due time, it came, bringing wonderful news: UB was invited to participate in “Time Space Existence,” a global exhibition to be held in conjunction with the Venice Architecture Biennale. It was one of only 32 academic institutions in the world selected for this honor. The Architecture Biennale has been held every other year since 1980, alternating with the even more widely known Venice Biennale, which began in 1895. While the latter celebrates artists, from painters to musicians, the Architecture Biennale showcases the most inventive and influential architects in the world. Both events, set in the glorious interiors of centuries-old palazzos along Venice’s canals, draw hundreds of thousands of people from around the world to witness the latest developments in art and architecture. After Dean Shibley hung up the phone, he conferred with Khan, Smith and Delaney. They would have to decide how best to represent the school and everything it does within a 14-by-20-foot space—and they’d have to do it by May 2018, when the event was to begin. And, in line with the school’s commitment to experiential learning, they would need to assemble a team of students to help them design, plan and bring to life their vision for the Venice exhibition. The concept came together so smoothly in part because it stems from a lived reality. The university, and in particular the School of Architecture and Planning, has long had a symbiotic relationship with the city of Buffalo. In fact, this connection is one of the reasons UB was selected to participate in “Time Space Existence” in the first place. People from the two arts organizations that oversee the exhibition (the GAA Foundation and the European Cultural Centre) saw articles in The Chronicle of Higher Education, in the periodical Design-Intelligence, and in Architect, the journal of the American Institute of Architects, which describe the school’s deep involvement with the city. The exchange between the school of architecture and Buffalo goes back to the school’s founding in the late 1960s. Delaney mentions Reyner Banham, a British architectural critic who taught at UB from 1976 to 1980, and his fascination with Buffalo’s grain elevators. In his book “A Concrete Atlantis,” Banham asserts that the elevators inspired modern European architects like Walter Gropius and Le Corbusier. The UB-Buffalo affiliation continued through the early ’80s, when, according to Bradshaw Hovey, senior fellow at UB’s Regional Institute, dozens of faculty, students and alumni were involved in the decades-long effort to save H.H. Richardson’s Buffalo State Hospital complex. They documented the vacant buildings, held symposiums to draw attention to the reuse potential of the campus, and worked on the actual rehabilitation and reuse of one of the buildings. Today, the Richardson-Olmsted Campus, which houses a luxury hotel and restaurant and is slated for further development, is a testament to what can be accomplished through passion and partnership. Yet another example is the Bailey Green master plan created by Associate Professor Hiroaki Hata and his students. This project aims to revitalize a neighborhood on Buffalo’s East Side in desperate need of some TLC. The plan—a thoughtful mix of affordable housing, community gardens, green infrastructure and retail—won an international urban design award in 2016 and is currently being executed with local partners, including Harmac Medical Products (the neighborhood business that initiated the project), Habitat for Humanity, and Urban Fruits and Veggies. “Today, there’s even more energy and enthusiasm around new ideas for the city,” says Delaney, crediting funding and tax credits from New York State for revitalization and development projects. “The school is able to engage students, not just on the model scale, but on full-scale projects that get installed in and around Buffalo.” Indeed, some of these projects are the stars of the film. With the film concept in place, the team looked next to John Paget, an award-winning documentary filmmaker who has produced several films about Buffalo. Paget, a 2012 graduate of the School of Management’s Center for Entrepreneurial Leadership, was, says Delaney, “the obvious choice” to be the film’s producer and director of photography. The team was particularly excited by Paget’s recent time-lapse work. “It was hours of waiting and watching the robot do its job,” says Paget. The robot was used to shoot the film’s complex time-lapse shots: It held the camera and was programmed by Paget to pan, tilt and even focus as it slid along a set of tracks. It would stop, take an image, move an inch, take an image, and so on—sometimes on tracks that were 70 feet in length. Producing a single shot, from planning to setup to execution, could take a day to complete. For a full month in the spring, Delaney, Paget and his crew came together to collect the images they needed to capture the soul of the school and its city. And while they wanted to emphasize all the positive work being done in Buffalo, Delaney knew they had to show that this “revitalization” is not happening for everyone. “We needed to show an honest image, that Buffalo has a complex history. It has a great legacy of architecture, but there are also neighborhoods that continue to see a lot of economic and population loss.” So they began with a list of 50 sites throughout the city that spotlight both triumphs and challenges, then whittled it down to locations with which UB has a direct relationship. 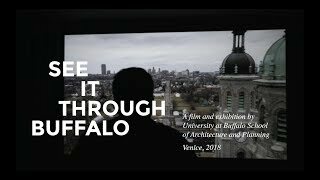 The result is a 15-minute film, titled “See It Through Buffalo” (inspired by a World War I slogan for Liberty Loan drives: “Buffalo will see it through”), that depicts more than two dozen scenes of the city, showcasing the contrasts that make Buffalo distinctive. The camera pans past decaying silos as well as shiny wind turbines; humble ethnic storefronts and the glorious terra cotta of Louis Sullivan’s Guaranty Building. The languorous rhythm of children on a swing set is juxtaposed against the frenzy of activity in architecture studio classes. While the visual tempo alternates between slow motion and quick time lapses, the soundtrack—mostly ambient sound captured on-site, but with an original score by Canadian composer Eli Bennett—“maintains the film’s academic and intellectual tone,” says Delaney. At the same time “See It Through Buffalo” was being planned, shot, edited and revised, a team of five students—two graduate and three undergraduate—was developing the “framework” through which visitors would watch it. Eric Burlingame (MS ’18, BA ’03), Kalyn Faller (BS ’18) and Nick Wheeler (BS ’19)—the fabrication team—were chosen to help design and build the environment that would house the film. Frank Kraemer (MArch ’19, BAED ’16) and Morgan Mansfield (BS ’19) composed the graphics team; their job was to develop a catalog and wall graphics to expand on the images shown in the film. Burlingame, who has a strong background in audiovisual production, was responsible for designing the acoustics. As he explains, “We wanted to present the film in a way that would be totally engrossing and captivating, yet wouldn’t disturb other exhibitors.” With help from the other students, he sourced materials from across the U.S. and Europe, including a premium, floor-to-ceiling screen from Austria along with top-quality speakers and reverberation-reducing acoustic curtains made in America. Faller and Wheeler paired up to design and build a bench for the space. “We went through so many design iterations,” says Faller. “Then we realized we could kill two birds with one stone by creating stools that could also be crates to carry items like tools and our catalogs to Venice.” The final design consisted of two crates separable into four stools, which could then be ratchet-strapped together to form the multipurpose seating area. Kraemer and Mansfield designed the catalog, a sleek, 8-inch-by-8-inch booklet bound in a textured, matte-black cover with two metal loops for hanging. Inside, images and accompanying text by Shibley, Delaney and Smith relate the history of the city and the school, provide information about each of the locations in the film, and contemplate the future of architecture education. During the days leading up to the Architecture Biennale, says Delaney, the fabrication team took all the ideas the team had for UB’s exhibition from hypothetical to actual—from conversations in Buffalo to installing the final project in Venice. During the day, these three students were not having the typical tourist experience. They were in the Palazzo Bembo, interacting with Italian and other European partners involved in “Time Space Existence.” But at quitting time, they would leave the palazzo to wander and get lost in the streets and along the canals of Venice. Shibley flew in to meet Delaney and the team and to attend the exhibition’s soft opening. They watched as hundreds of people passed through UB’s darkened space and stopped to observe “See It Through Buffalo” as it played on a loop, the whir of turbine blades and the hum of busy students filling the room. In August, Delaney returned to Venice with 15 students and five faculty members for a study abroad program. The UB faculty engaged the students in tours and activities held throughout the city of Venice, delving into topics like preservation and adaptive reuse, as well as sustainable tourism. They even embarked on a “scavenger hunt” to determine the availability and cost of essential goods and services, as both have been impacted by Venice’s 60,000 daily visitors. The program culminated with a workshop, also led by UB faculty, which was held at the U.S. Pavilion and available to anyone attending the Biennale. The workshop built on “See It Through Buffalo,” but also was tied to the Architecture Biennale’s theme of citizenship, and focused on the new role people in industrial cities, like Buffalo, must play in developing innovative solutions to address current social, environmental and economic challenges. The exhibition itself is on display through Nov. 25, but by no means will that be the end of its run. Shibley mentions a roster of other events and projects that will stem from the film, including a series of web-based essays, articles, videos and illustrations highlighting each location in the documentary and the kind of work the school of architecture does within those spaces. A book is in the works, and there are plans to submit the film to festivals that celebrate documentary filmmaking. And, of course, “See It Through Buffalo” will be on exhibit in Buffalo, New York City and other locations around the country. Rebecca Rudell is a writer based in Buffalo. The 25-plus locations in the film include world-renowned masterpieces, UB campus buildings, and such structures as the former Niagara Machine and Tool Works, which UB is helping to transform into a manufacturing and workforce-training site on Buffalo’s East Side.